Most of us spend our lives drifting along on the Earth’s continental plates, giving little thought to the mysteries that lie below. Geophysicists are different. They want to understand the underworld: our planet’s ever-shifting tectonic plates, deep pockets of magma, and stress-relieving earthquakes. Show them a No. 2 pencil and it reminds them of a fault line that will flex and flex and flex—and then . . . snap. Pick up a baseball, and in the stitching that encircles it, they see the patterns of our mid-ocean ridge system. Always, they want to know how and why. Why is the Cascadia Subduction Zone so quiet? How big is the magma pocket under central Oregon’s Newberry Caldera? What is the structure of the Aegean Sea’s Santorini volcano? And increasingly: Why doesn’t the West Coast have an Earthquake Early Warning System? UO geophysicists (and husband-and-wife team) Doug Toomey and Emilie Hooft are key players in the search to understand volcanic processes, plate tectonics, and yes, that giant earthquake that is forecast to wreak havoc on the Northwest coast. You’ve seen the news. In what is known as the Cascadia Subduction Zone, ranging from northern California’s Cape Mendocino to Vancouver, British Columbia, three plates—the Gorda, Juan de Fuca, and Explorer—are slowly sliding under the North American plate. But they are not grinding and slipping and letting off steam as they subduct. The fault line is locked, eerily quiet relative to other subduction zones, and building up a lot of stress. Of the four corners of the Pacific, ours is the only corner where there hasn’t been a huge earthquake—magnitude 9 or greater—in the last decade. The last one happened here in 1700; historically, the interval between events has been observed to vary from 200 to 800 years (a 1 in 300 possibility each year, according to Toomey). A destructive tsunami will likely follow, hitting the Oregon and Washington coasts within 20 minutes. The disaster is expected to cause financial losses of at least $60 billion as well as loss of more than 10,000 lives. To help prepare for the Big One, Toomey and a team of scientists (which includes Hooft as well as others from universities and research institutes throughout the US) have put together the National Science Foundation–funded Cascadia Initiative, a four-year project that uses an array of 70 ocean-bottom seismometers (instruments that measure seismic waves created by ground motion) deployed at more than 250 sea-floor sites to monitor the Juan de Fuca plate’s movement. 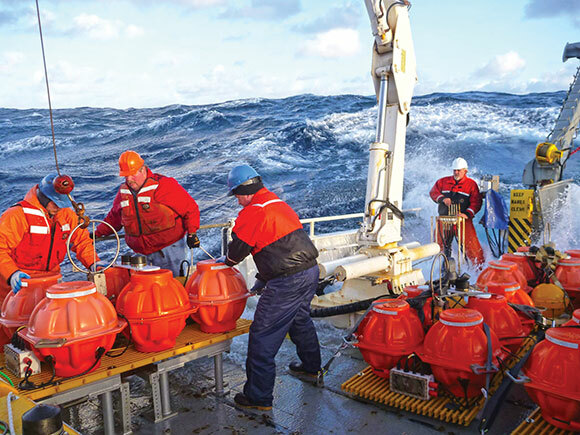 The team has conducted marine expeditions six times each year for the past four years, during which they installed and retrieved the seismometers. Many of the voyages included geophysics and postdoctoral students, giving them valuable research experience. Preliminary results are being released and more are expected after the last instruments are picked up this fall. “Seismic tomography is like a CAT scan for the Earth,” Toomey says. “We can measure the structure of the Cascadia Subduction Zone and compare this to surface geology, uplift rates, and the distribution of earthquakes and their focal mechanisms” (how the Earth deforms and breaks). As the research has progressed, Toomey has become an increasingly vocal advocate for a West Coast Earthquake Early Warning System that has been developed by the University of California at Berkeley, the California Institute of Technology, the University of Washington, the US Geological Survey (USGS), and the University of Oregon. The system will give advance warning of strong shaking—after an earthquake has been detected but before the shaking arrives—providing minutes of warning for earthquakes on the coast (three to five minutes for Portland and Seattle, respectively, if the earthquake begins in northern California) and up to 30 seconds of warning for large earthquakes near Puget Sound and Portland. That might not sound like much, but in the best case, it would allow time to take such measures as evacuating schools, halting trains, shutting off machinery, stopping sensitive surgeries, and issuing tsunami warnings. So Toomey has a new and urgent role: lobbyist. He has traveled to both the state and federal legislatures to advocate for the system, which will cost $16.5 million a year to operate. Former Oregon governor John Kitzhaber allocated $670,000 to buy 15 high-quality seismometers, and Congressman Peter DeFazio is “a real champion of earthquake early warning,” Toomey says, noting that the federal government has put up $5 million. But more money is needed to set up and run the network. Continents are old, Toomey notes, and are embedded in a system of ever-changing tectonic plates. Eighty-five percent of the annual volcanic activity on the planet occurs underwater along the mid-ocean ridge system, which constantly generates the material that forms the new oceanic parts of the plates. “This conveyor belt of generation, evolution, and subduction is processing the long-term chemistry of the oceans and the atmosphere,” he says, explaining that carbon dioxide comes out of volcanoes, goes into the atmosphere, and ends up in the ocean, where it makes carbonate sediments that get subducted back under the continental plates, reemerging at volcanoes that emit carbon dioxide again. “This cycling of CO2 has provided the long-term thermostat of our planet,” he says. His team’s main research goal for the past five or so years has been to understand why mid-ocean ridges are segmented. “There has been a dominant model in our community that we are about to disprove, using data we’ve gathered from the Endeavor segment of the Juan de Fuca ridge,” he says. The prevailing theory has been that the ridges are segmented as a result of blobs of magma rising to the surface. But now that the team has been able to monitor the flow rate and direction of the mantle (the semisolid layer that lies underneath the ridges, between the Earth’s crust and core), they believe that the plates are constantly reconfiguring in reaction to subduction zones around the world, and that the segmentation of the ridges is caused by how the surface plates are behaving or responding to changes in rates of subduction. “So we are finding a global top-down system,” Toomey says. Hooft, an associate professor, earned her PhD in oceanography in 1997, also through MIT and the Woods Hole Oceanographic Institution, and arrived at the UO as a research associate in 1999. She is chief scientist on a research project at Newberry Volcano in central Oregon, where she and her team of students have been using seismology to pinpoint the properties of its magma chamber. The volcano erupted and collapsed about 70,000 years ago, leaving a five-mile-wide, oval-shaped caldera. The area is still very “hot” (as evidenced by the eruption of the Big Obsidian flow 1,300 years ago and by a number of geothermal springs) and although it is currently in a quiet phase, it is on the USGS list of volcanoes with the highest potential for eruption. Measuring its magma chamber allows the geophysicists to ascertain how deep the chamber lies as well as how molten it is. Until now, it has been difficult to measure small chambers, and part of this research has been to find better ways to understand these relatively small systems that aren’t easy to measure using traditional methods. Hooft’s team began collecting data in 2008, digging holes and installing 81 closely spaced seismometers. After using a drill hole explosion to create seismic waves that traveled through the earth, they measured how the waves rippled, distorted, and indented as they came to the surface after having gone through the magma chamber. They also measured waves from teleseismic earthquakes (very large earthquakes that happen around the world), and by using the two sets of results, they were able to pinpoint the size of the chamber. 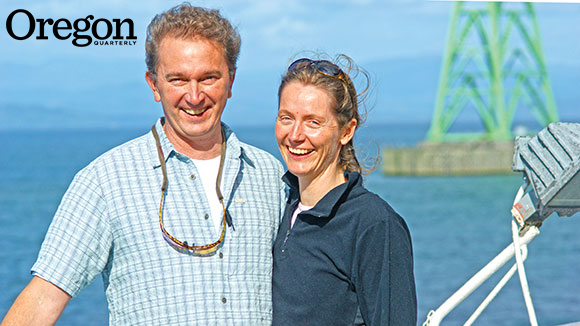 Toomey and Hooft sometimes travel together on a research project, such as one coming up this fall when, along with geophysicists from England and Greece, they will explore the structure of Santorini Volcano in the Aegean Sea. “I’ve always been very interested in understanding magma plumbing under volcanoes, especially deep down,” Hooft says. She wants to figure out how andesite, an evolved type of volcanic rock, is created. One of the reasons she chose Santorini is that the Earth’s crust is not very thick there because of earlier stretching of the tectonic plate. Also, because the caldera is underwater, the team can use equipment that generates bubbles of compressed air to create measurable sound waves. “We will be able to ‘see’ deep into the lower part of the crust and the top of the mantle and be able to reconstruct those regions where the magma is being processed,” Hooft says. “This will bring some constraints to these differing models on how andesite is formed. So the next time you’re driving over the Cascades or gazing out at the mighty Pacific, consider that underneath that lovely vista, the Earth is growing and growling, lifting and subsiding, growing new plates from deep inside and subducting others under the continents. We live on a planet in constant change. And always, geophysicists are asking why and how.